On January 15, 1919, Boston was struck by a wholly unique tragedy: a storage tank in Boston’s North End, holding over 2 million gallons of molasses, collapsed, sending a deadly tidal wave of sweet, sticky sludge through the streets. The force of the flood bent steel girders, tore buildings off their foundations, and injured 150 and killed 21 people. Award-winning local author Stephen Puleo will discuss the flood for its hundredth anniversary, bringing humanity to the many lives altered by this catastrophic event. As stated by the Associated Press, “the cleanup lasted months, the lawsuits years, the fearful memories a lifetime”. 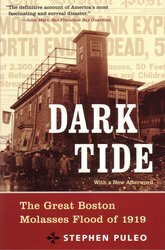 Copies of Puleo’s book “Dark Tide: The Great Boston Molasses Flood of 1919” will be available for purchase and signing.